I headed out to Inishmore yesterday for a day trip to see if there was much doing out there. No doubt the island has had several American waders and maybe even a few Yank landbirds passing through the island in the last month or so but of course as usual there was no one out there to record them. I started out at the lough at Barr an Phointe but the water levels very extremely high so there was little or no suitable habitat for waders. The only birds seen were close to 30 Teal and a few Mallard and Moorhens. One White Wagtail on the beach. Next stop was Loch Phort Chorrúch where things were similarly fairly quiet on the lough with low numbers of the usual fare with another White Wagtail with large numbers of Rock Pipits on the storm beach. Again the water was very high on the lough. A huge shingle embankment was artificially created on the seaward side last year after severe winter storms. This was probably done in the misguided intention of protecting the lough but may in fact cause unforeseen damage to the lagoon. There has been a shingle bar protecting the lagoon since at least the mid 19th century. These works may have a negative influence on the hydrology of the lagoon. However I'm can't say for certain as I'm not a hydrologist or an expert in lagoons but I highly doubt these works were carried out on the advice of such an expert either! Time will tell what the outcomes will be. Well worth a visit if you're out that way anytime. I particularly like her "Bathing Bumblebee", stunningly detailed piece of work. I even picked up a t-shirt designed by Rónán who has been dappling with the pencil in recent years a well. I checked most of the usual spots around Kilmurvy but the only thing of note were a few Goldcrests and an unseen calling Sylvia warbler scolding a resting male Sparrowhawk. As the ferry was due to leave early at four I knew I wouldn't have time to properly check further west and was just about to head back east when I got a text from Mick Boyle to say he had an Icterine Warbler on Inishmore! Unbeknownst to either of us we had both come out on the same 1030 hrs boat but hadn't seen each other due to the large numbers on the boat. I rang Mick to say I was only 15 minutes away and would be straight up. I met Mick on the road below what we call the Blackpoll Ridge, which is above the Seven Churches. Mick was leaving to check further west. He said the bird was showing well and even managed to get a few shots of it. With time running out the pressure was on. Thankfully after a short wait I picked up the bird moving typically sluggishly around in an Elder tree. While not particularly shy it could spent long periods of time just sat in the middle of the tree which could mean that it could have easily been overlooked. As the cliff face was sheltered enough you could usually hear the bird moving amongst the vegetation when unseen and occasionally hear it bill-snapping as it caught passing flies and other insects. The light was very harsh and a lot of my photos were over-exposed even when I had dropped to -2/3 stops on the camera. It was a very grey bird with the lightest suffusion of lemon yellow on the centre of the belly and somewhat around the face in some light. Poorly seen, Eastern Olivaceous Warbler or even a Blyth's Reed Warbler could have been a possibility. 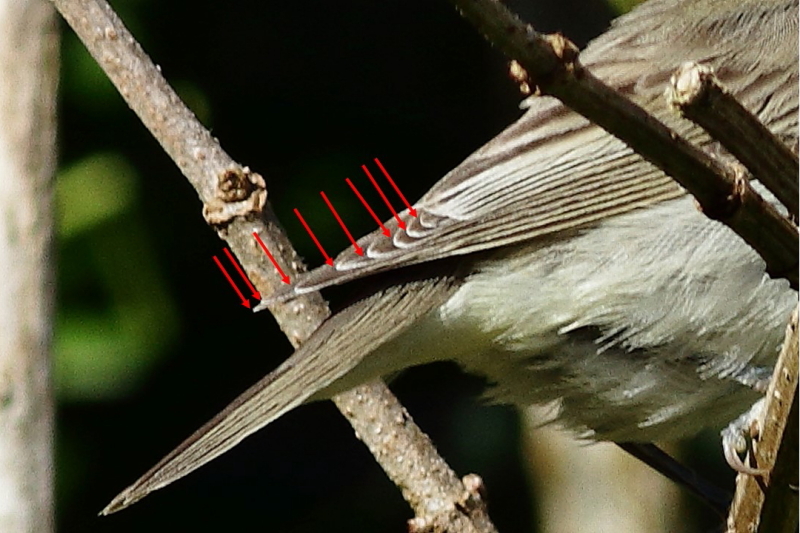 Thankfully the long primary protection (eight primaries visible) with uneven primary spacing, square shaped tail, steel-grey legs, pale wing panel and pale grey greater coverts pointed in the Icterine direction. It's also possibly also a juvenile bird as the wing feathers appeared to be still quite fresh , the pale wing panel was still rather obvious. John Murphy and Tony Mee had an Icterine Warbler at Gort na gCapall also on Inishmore on 5th October 1998 but unfortunately the record was never submitted. These are the only county records to date. Unsurprisingly they are quite a rare species on the west coast of Ireland with counties Cork and Wexford receiving the majority of records. I can only find two Clare records and can't find any Mayo records for the matter (open to correction). The species has got rather scarce in Ireland in recent years for some reason as there were no records for Ireland at all in 2011, 2012 or 2013 (seven in 2010 though!). Melodious Warbler while very similar in appearance has also shared this decline in national occurrences and also in it's rarity on the west coast. Peeking out of the middle of the Elder tree. Rather Blyth's Reed in this pose. Lemon yellow stripe down the centre of the breast. Showing some of the yellow tones around the face. Uneven primary spacing with eight primaries visible (p2 - p9). Great selection of images, Dermot. Excellent read.